We still have a long way to go to meet our goal for 2015-16. This year we plan to establish a secure financial base that assures the investment we have all made throughout the city, Avenida Mexico, Basilio Badillo, Lazaro Cardenas Park, etc. continues to grow and thrive through our maintenance program. We also want to expand thinking and programs. We are keeping dues low at $500 pesos for one or $750 for a couple ($30/$45 USD) but encourage everyone to give more. We’ve introduced an Annual Giving program with three levels: $1,500, $4,000, and $8,000 pesos- ($100/ $250/ $500 USD). 1. 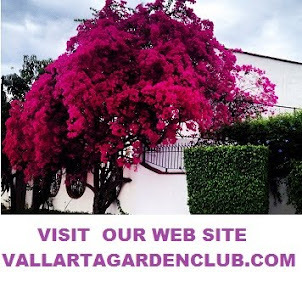 PayPal: go to http://www.vallartagardenclub.com/donate.html and click on the PayPal button. Please add 50 Pesos for expenses. 2. Galleria Dante where you can leave an envelope to the attention of PV GARDEN CLUB: Basilio Badillo 269, in the Zona Romantica. 3. Intercam Bank: Plaza Molino de Agua at the corner of Vallarta and Aquiles Serdan in the Zona Romantica. : You can deposit CASH ONLY to the following account: P.V.GARDEN CLUB AC, account Nr. 007-99857-001-2… but you have to let us know the transaction number, otherwise we cannot find out who paid. 4. OR even much simpler…call us at 322 222 4019 to pay over the phone with our new terminal. We enter your debit/credit card number, the amount to be paid and we then send you a receipt with the stub.